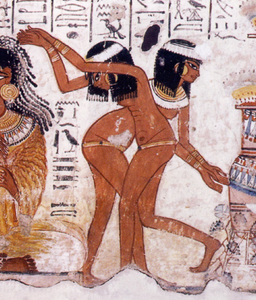 Dancers from the tomb of Nebamon (TT 90). XVIII Dynasty. Due to the estrict rules of the Egyptian art, artists in Ancient Egypt needed to find unnatural ways of expressing some movements, especially during the Old and Middle Kingdom. Distorsion and sprain characterises dynamic scenes (dancing, acrobaces, games…) in those periods of Egyptian history. However, from the New Kingdom dynamism appears in Ancient Egypt decoration in a more natural way. The Egyptian artist gradually treated the bodies in movement in a less rigid way. And one of the elements which helped them was the hair.